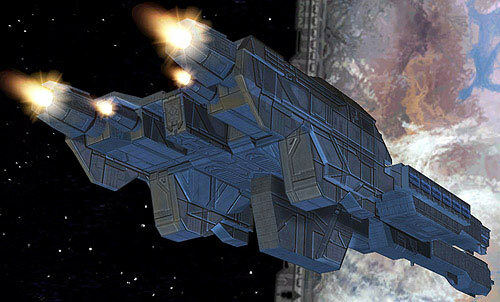 This is a rendering of the UNSC ship In Amber Clad as seen in the video game Halo 2. The frigate is commanded by Commander Miranda Keyes, daughter of the late Captain Jacob Keyes, of the UNSC cruiser Pillar of Autumn. This model will be made in the same way as the in-progress model of the Pillar of Autumn I have underway. 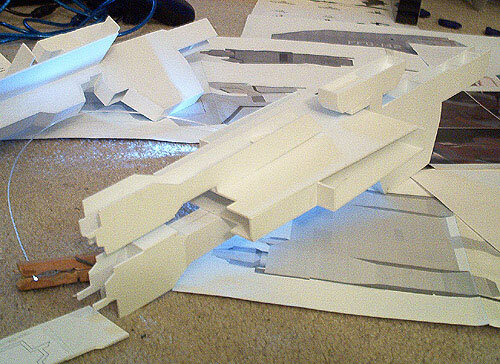 It will also be built to the same scale, 1/1000. Where the Autumn is about 46" in length, the In Amber Clad will be shorter at almost 19" long. The model started out with extensive research. Some of that involved many hours of having the Master Chief running around on top of the ship as it was docked with the Cairo space station. More was just pouring over any pictures and screen captures I could find from the game. After getting some line diagrams printed to full model size, I used Illustrator to draw what would be the internal spine for the ship. I will be building a double spine which will not only be structural support, but also a segment of the ship's outer structure. 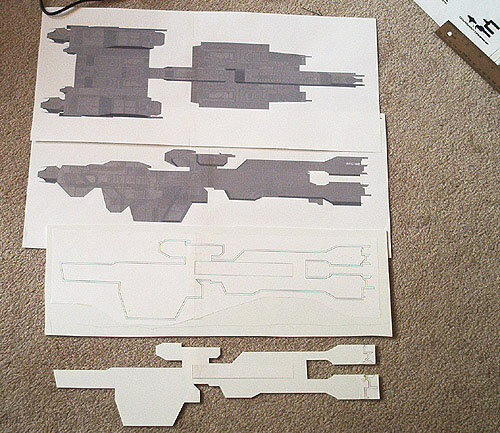 The four pieces to the left are the top render, side render, Illustrator side view along centerline, and the same again, only cut out from the plastic. The centerline diagram has a double line thickness...the outer line is the overall dimension of the ship. Using Illustrator's Offset Path tool, I was able to get another line, drawn inwards of the outer line, displaced exactly the thickness of the plastic I'll be using. This will give me a surface I can plank on the outer hull to bring the dimensions back to full size. More progress shots as it begins to take shape. Now both side-view profiles have been cut out. 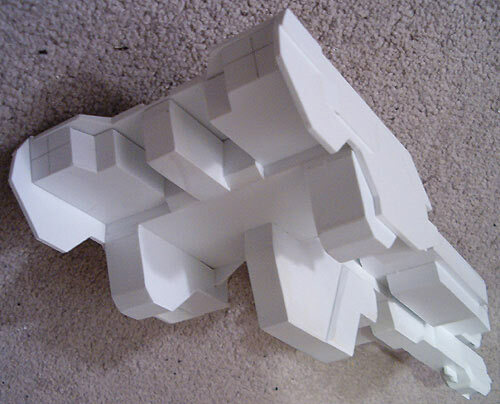 Spacers made of small pieces of plastic cut to the proper width are glued in place to separate the two profiles. 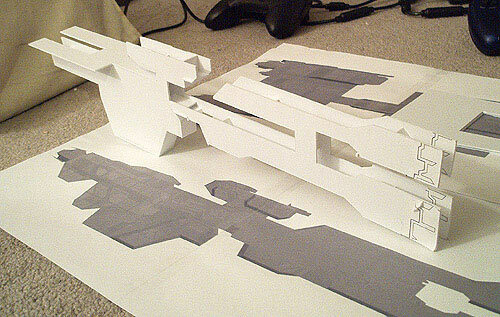 I still haven't cut the details out of the front section yet as it's quite complex. Here's the In Amber Clad profile with the Pillar of Autumn in the background. As with the Autumn, I'm going to try to light the In Amber Clad where appropriate: the 4 engines, the bridge window, and the 8 lights at the bow. 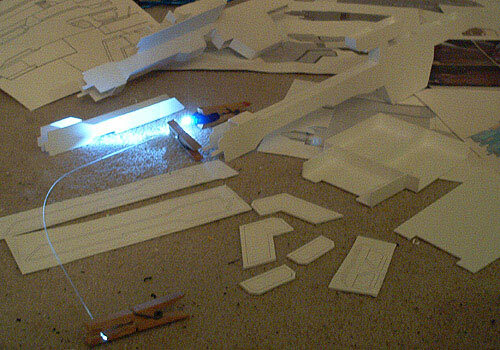 I'll have to see what lighting is feasible for the inside as the small size of the scratchbuild is pretty cramped for space. 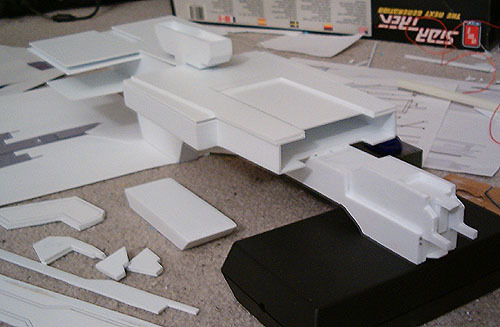 Hit a snag with the design unfortunately...something that happens now and then in scratchbuilt endeavors. I started making the necessary corrections, but it seemed too much needed changing. I decided to start the project over again from scratch...no pun intended. The 'old' In Amber Clad can be seen to the upper left, and that's how it will stay. The new revised one is about to the same point now as the other had gotten to. One design change was made to allow the parts a little more strength and ease of lighting. The upper front prong was left off. In the old one, I had to cut it off. I redesigned the ship so it could be a later attachment. You can see here the lighting I intend to use. 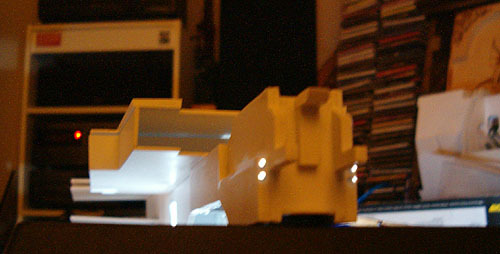 I will have3 clear LEDs used to light the four engines, the bridge, and the eight forward spotlights. You can see in this picture and the next an LED lighting up one of the eight fiber optic strands that will illuminate the forward spotlights. This is a better lit shot showing the progress to date of the various shapes just placed together. The large wide area in the middle of In Amber Clad will have a slide out tray on the port side to access a battery compartment for the LEDs. The forward prong in this shot is actually the old one from the first design. I have redesigned the forward prong again and part of it can be seen prior to cutting it from the plastic in the lower left corner, below the fiber optic end. More structures have been cut out from plastic. Not all can be glued in place yet until other structures are completed. The concentration has been on the forward lower hull. The two dark dots on the forward-left are fiber optic cables to transmit light from within. There are four on this lower mandible, and there will be a corresponding four more on the upper mandible. The next shot shows a lighting test. This photo shows the fiber optics lit by the LED. This shot was taken in almost total darkness without a flash and the fiber optics are still very bright to the camera. They are less bright to the eye, so I'm not worried about them appearing overpowered. The LED (to be installed internally) will light up not only the 8 fiber optic cables, but also the lighting for the main bridge. 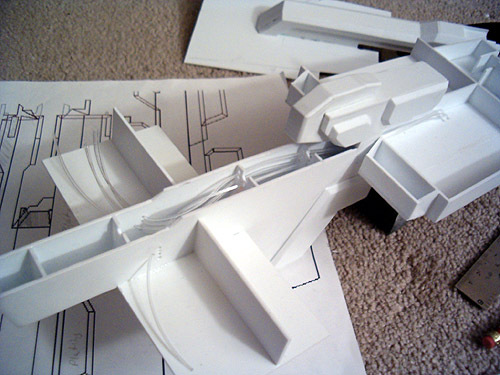 More structure has been completed on the model. The bridge is now in place and the fiber optics are installed within. In this picture, you can see how the front 4 fiber optics from the lower mandible are being snaked along through the center of the ship. They will be illuminated from 4 LEDs to be installed in the back for the engines. 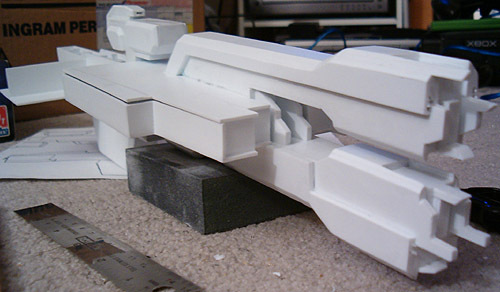 More of the thick beveled details have been made and attached to the ship. Although it has not been glued in place yet, the upper mandible of In Amber Clad has been built. The 4 fiber optics in this part have yet to be strung through to the back of the ship. Once the rest of the electrical wiring is soldered and the battery area constructed, the upper mandible will be glued in place and more attention can be given to the In Amber Clad's engine area. Now the engine section of the ship is nearly complete. The wiring, which is already soldered, is ready for installation, and as soon as that's complete, the upper mandible will be in place and the remaining fiber optics will be installed. At the right of the picture is the paper designs drawn up for the engines. The four engines are identical in appearance, though the inner two are about half of the main engine's size. This picture better shows the aft engine area of In Amber Clad. 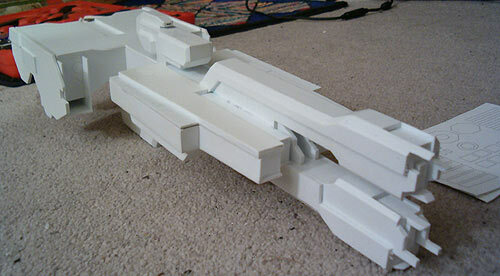 A few more structural details must be made, but overall the ship is nearly physically complete. I made pencil cross marks where the engine's center points will be. 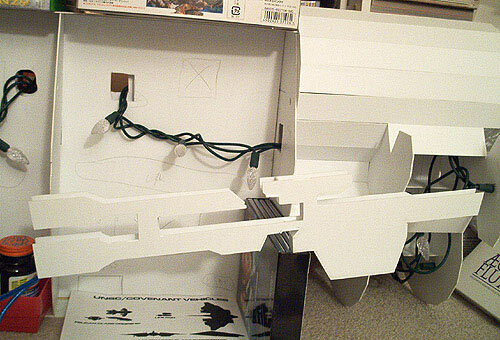 This is so I can line up the LED light on the inside. 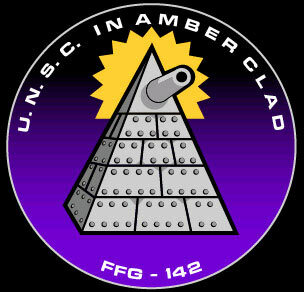 This is the emblem for the In Amber Clad, as worn on the right shoulder of the crew's uniform. This diagram was drawn with Adobe Illustrator. Photos and artwork by Stephen L., In Amber Clad design & rendering by Bungie.